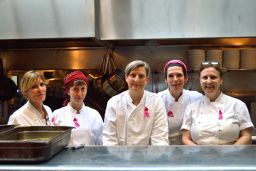 'Pink Plates' launched at Moro on Monday 8th May with an exclusive dinner hosted by Sam Clark, who was joined in the kitchen by Britain’s top female chefs including Angela Hartnett, Margot Henderson, Thomasina Miers and Skye Gyngell. The launch dinner raised a total of £35,846 for Breast Cancer Care which is a fantastic kick off to the campaign. The campaign will then finish with a closing dinner on Sunday 2nd July hosted by Sarit Packer at Honey & Co, where Sam Clark will be announcing the total amount raised for Breast Cancer Care by 'Pink Plates'.